Click Here To See Amazing Spider-Man #184 Comic Book! 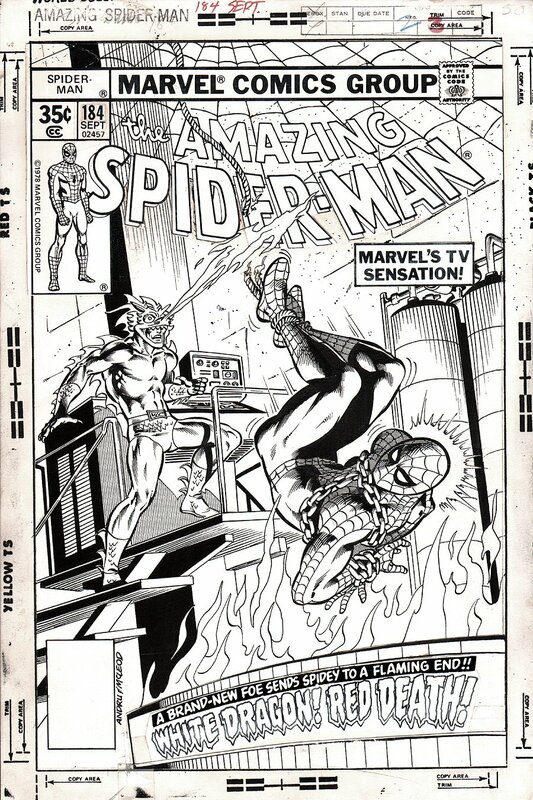 Check out this very nice, very RARE 1978 Amazing Spider-Man cover which was penciled by the great Ross Andru, and inked by the great Bob McLeod, from the story titled: "White Dragon! Red Death!" 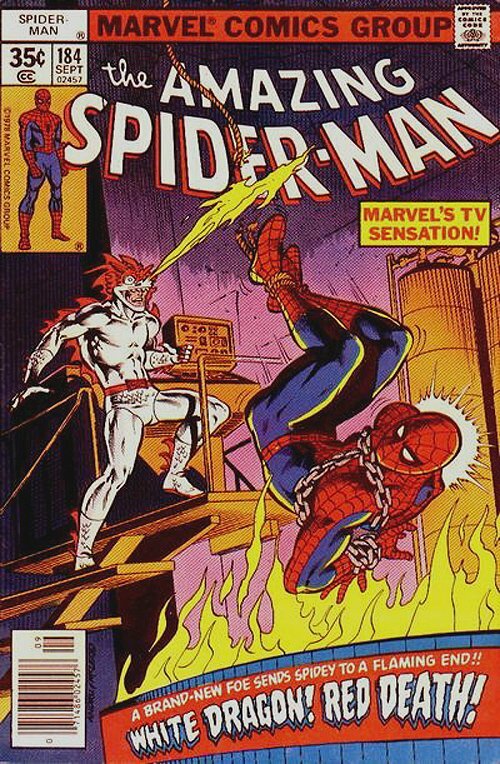 This nice cover features a chained up Spider-Man getting ready to fall into a fire pit by the evil White Dragon! In case you are wondering.... Ross Andru drew nearly as many ASM issues during the first 300 issues as any one artist! Ross Andru is arguably considered the #3 best Spiderman artist during it's first 300 issues, (After Steve Ditko and John Romita Sr.) yet only "3" ASM covers have EVER surfaced by Ross Andru! This cover, inked by the Great Bob McLeod is one of the very best drawn covers from that list! So don't miss out on quite possibly your ONLY chance you may ever have to owning a Bronze Age 1970's Ross Andru "AMAZING SPIDER-MAN" COVER! Compare this nice 1978 cover art to the published comic book in the red link above! ALL HIGH end pieces of art, including this one, are able to be purchased with VERY fair time payment plan options, and trades are always considered towards this and "ANY" art on our website! Just send us an email to mikeburkey@aol.com and we can try to work something out.